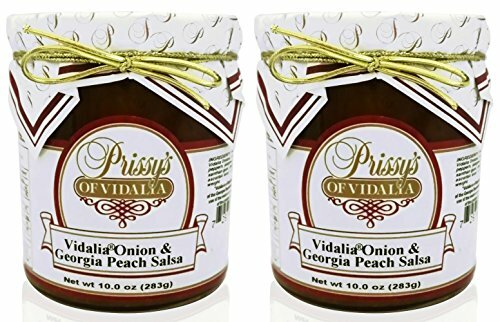 Prissy's of Vidalia Onion and Georgia Peach Salsa, 10 oz (Pack of 2) FAT FREE and CHOLESTEROL FREE. With the honorable distinction of being the world's sweetest onion, Vidalias have become justly famous all over the globe. The intriguingly mellow, juicy sweet flavor is a result of the mild climate and unique soil composition found only in Southern Georgia. The official state vegetable, this remarkable onion can be enjoyed in many ways. A wonderful unique salsa is excellent with chips or great simply served over cream cheese. Excellent as well for broiled or baked fish or chicken dishes. FAT FREE and CHOLESTEROL FREE. Made with fresh peaches, Vidalia® Onions, vinegar, red bell peppers, jalapeno peppers and other carefully selected spices, this wonderful unique salsa is great with chips or great simply served over cream cheese. This deliciously sweet and spicy salsa dip and topping adds a delicious twist to sandwiches and pork dishes. Excellent as well for broiled or baked fish or chicken dishes. Makes a great dip as well. If you have any questions about this product by Prissy's of Vidalia, contact us by completing and submitting the form below. If you are looking for a specif part number, please include it with your message. Pace Chunky Salsa - Medium - 2/38 oz.